Only an Administrator, Editor, or the post's Author can change a post's password or visibility setting. To do so, use the "Visibility: Edit" link again. These settings are also available using the post's Quick Edit link in the All Posts Screen. The Visibility "Edit" link (or "Quick Edit") is also a good way to reveal a forgotten post password. WordPress stores this password in a browser cookie so readers don't have to re-enter passwords if they visit the same page multiple times. Furthermore, if multiple posts use the same password, the reader will only have to enter the password once to access every post (see caveat below). WordPress will only track one password at a time. Therefore, if two posts use two different passwords, entering the password for post A, then entering the password for post B means that revisiting post A (or any post which shares its password) will require the user to re-enter the password for post A. The post_password_required function within in an if statement is also handy for other customizations, such as preventing password-protected posts from displaying in a list. 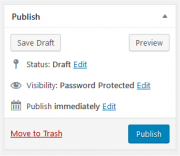 With WordPress Filters you can: change the default text in the password form, change the default text for the password-protected post Excerpt, and insert the password form into the post Excerpt. To do so, add the following code to your custom plugin file. The password form displays this default message: "This post is password protected. To view it please enter your password below:" The following code will return the form with different text and different html structure — in this example the custom message is: "To view this password protected post, enter the password below:"
Please note: the my_password_form function must return a value: don't use print or echo. Make sure to set the maxlength parameter to a value of 20 when replacing the password protection form as WordPress will only save the first 20 characters due to database constraints. Replace "<em>[This is password-protected. ]</em>" with your custom password-protected Excerpt message. This will get the default WordPress password form and text or any customizations you've made. For a better understanding of how post_password_required() and get_the_password_form() work, read their function definitions in wp-includes/post-template.php . In this same WordPress core file you'll also find the the_excerpt and the_password_form filters, and the functions get_the_excerpt() , get_the_title() , and get_the_content() . These functions control how a post's title, excerpt and content display, depending on its visibility setting. This code works in two parts: the first part effectively removes any password protected posts directly from any SQL query that WordPress is running, using the posts_where filter . The second part adds this filter to all pages except single posts, pages, and admin pages. For more information on why pre_get_posts is the right action for this function, see the pre_get_posts action reference .